There are two types of wigs, human wigs and synthetic wigs. Human wigs are made with human hair and synthetic wigs are made from man made fibres. Both types offer advantages and disadvantages when it comes to choosing which types to choose for your lifestyle and for your purse /wallet. Human wigs can be expensive depending on style, hair length and where you purchase them from. The advantages of purchasing a human wig is the versatility you will have. You are able to achieve different styles with a human hair wigs. The use of your hair straighteners, heated curlers and other hair heated tools are no problem when it comes to styling your human hair wigs. Due to the fact that you can do a lot more to a human hair wig, you can take your wig to a hair salon and get them to do the aftercare and restyling for you. However this can become costly depending on how often you want it restyled. The only downside with human hair is the expense; this can still be turned into a positive for human hair wigs do last longer, so you are really getting value for money. 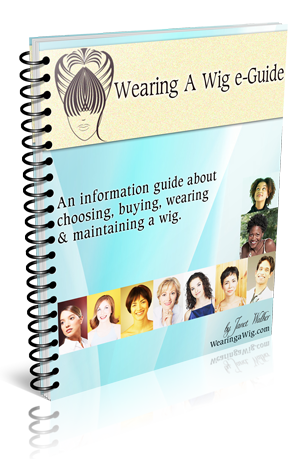 Synthetic (meaning acrylic) wigs are usually much cheaper to purchase than human ones. The advantages of synthetic wigs are that you don’t need to worry about styling it everyday, like your normal hair because the style is already molded into shape. The disadvantages of synthetic wigs are that you cannot use your hot heated styling tools. The up side to synthetic wigs is the colours and styles. You can get a large selection of styles in human but it’s even larger in synthetic. Due to the fact that the style is already preset on synthetic wigs, it makes them much easier to maintain. You still can wash your synthetic wig but the drip dry method is used to dry your wig, which is really simple to do. The colours available for synthetic wigs are vast; you can get neon colours, bright colours, and many combinations of mixed colours. The fun wacky themed styled wigs are more than likely made of synthetic. Many ask the question, “How long do synthetic wigs last?”, well they don’t usually last as long as human wigs, but that also depends on how often you wear your wig, how you store it and how you maintain it. Whichever wig type you choose synthetic or human, comfort-ability is the most important factor. It’s all about what you can afford and what you are happy with in terms of colour, style and wear ability. Previous story Where does Human Hair come from?